Amidst the acclaim, players and critics alike have pointed out that Prey has a lot in common with Bioshock. Nothing wrong in that: some visual and mechanical cues remind us of a much-loved game while the new one builds novel concepts atop that which we love. After spending a few hours, though, it’s hard not to see its influences and sources of inspiration everywhere. Dishonored is an obvious and unhelpful touching point, seeing as it came from the studio. Prey refines some of the best aspects of that game. Once you can see beyond that, there are a host of other references. Some of them aren’t sci-fi games, and some of them aren’t even good games. It doesn’t matter: they’re all grist to Prey’s recycling mill. This is what we’ve spotted in the recipe so far. One of the first things you’ll see in Prey is your TranStar suit hanging on the back of the door. It’s orange and black, with a prominent collar and shoulder pads. 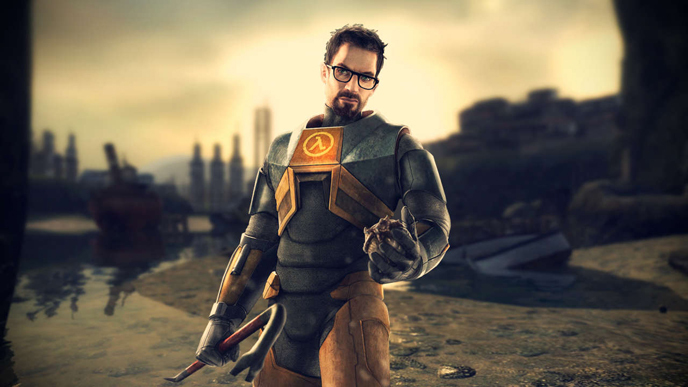 It’s is an awful lot like the suit Gordon Freeman dons at the start of Half-Life. The earliest enemies in Prey bear a passing similarity to the horrible Headcrabs that infested Half-Life. Their four-armed shape and movement makes them visually similar. And their habit of hiding and leaping out right at your face makes them similar in behaviour as well. And this may be coincidence, but there’s a tenuous staffing connection. The designer of Half-Life 2’s City 17, Viktor Antonov, spent time at Arkane working on the Dishonored series. The first weapon you get in both games is a big, heavy wrench. Not something you’d usually think of as a weapon, but anything will do when you’re surrounded by mutant alien nasties. However, that’s just the beginning. Not far in to Prey you’ll find a Neuromod, an item that can enhance your skills. Later you can use them to add superhuman abilities to your arsenal, much like Bioshock’s plasmids. And in both games the fallout from humanity trying to play God has been very grim indeed. As a final nod, many portions of Talos 2, Prey’s space station setting have a distinctive Art Deco design. Much like the underwater city of Rapture where Bioshock takes place. Wait, though. 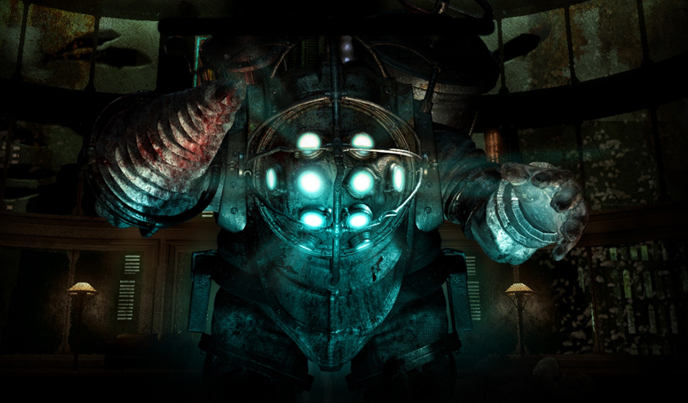 The wrench in Bioshock was itself in homage to an earlier game: sci-fi horror System Shock 2. Released in 1999 it’s had a big impact on generations of games, and gets frequent references. The use of 0451 as a door code appears in Bioshock, Deus Ex, Thief and other games, even Firewatch. It’s often presumed to have come from the novel Fahrenheit 451. 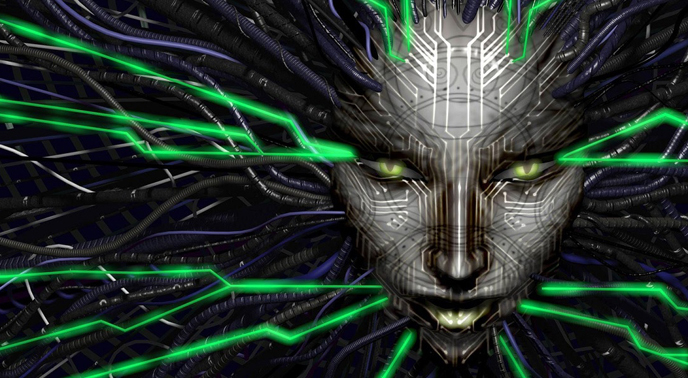 And so it did: in the original System Shock game, repeated in the sequel. And guess what? The same door code reappears in Prey. One of the QA team on System Shock, who no doubt tested that door code, was Harvey Smith. 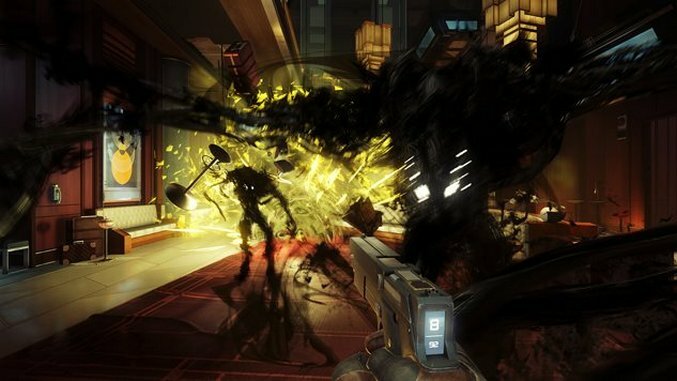 His stratospheric career arc has taken him, currently, to being co-creative director at Prey’s creator Arkane. After the wrench, the next weapon you’ll find is the Gloo Gun. Except it isn’t much of a weapon at all. Instead, you can use the sticky blobs it fires to get creative on getting around, like building staircases or impromptu crash mats. 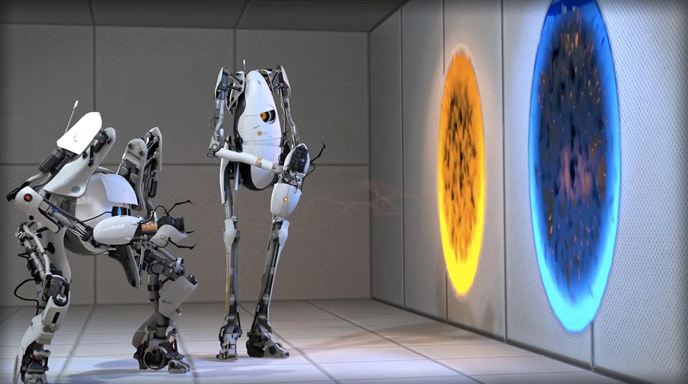 Using a gun to invent ways of bypassing movement barriers is also the premise of first-person puzzler Portal. But wait: the portals that lent that game itself appeared somewhere else first, albeit not fired from a gun. They came from a 2006 game called Prey, of which this 2017 version is an alleged reboot, although it kept almost nothing but the name. Another thing in Prey that looks and sounds a lot like something from Portal is the AI gun turrets. Sure, in this game they’re protecting you rather than trying to kill you, but the way they talk to themselves in both games in uncanny. Another game that features auto-turrets is this unfortunate entry in the Alien gaming franchise. And in Prey, the acidic fingerprints of that franchise look to be all over the place. In addition to the turrets, the early Mimic enemies seem a lot like Facehuggers. They even subdue their victims by shoving one grotesque appendage down their throats. 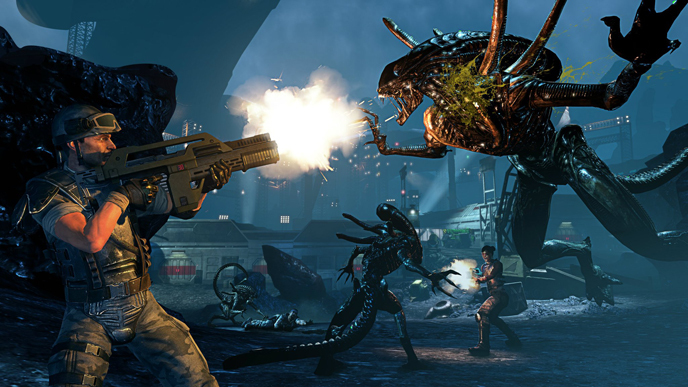 Adult Xenomorphs from the franchise are the result of a takeover from a human host and can appear and disappear with startling speed. These are all traits shared by Mimic Phantoms, as well as a vaguely humanoid outline. Plus, anyone familiar with the film Alien and its gaming tribute Alien: Isolation will know how much time they show people crouching in vents. Is it coincidence that vent-crawling is a common way to circumvent locked doors in Prey? What’s this doing here? It’s a fantasy role-playing dungeon crawler, not an open world sci-fi thriller game. Surely there can’t be any similarities, even though they’re both from the same studio? Well, it won’t be long in Prey before you find your first character sheet for a game called Fatal Fortress. There are several, and it seems some of the crew were playing a tabletop role-playing game. Then you find the Game Master’s Tome which contains a synopsis of Fatal Fortress: and it’s the same synopsis used to describe Arx Fatalis. Prey’s lead designer Ricardo Bare has also admitted that Arx Fatalis provided inspiration for Prey’s open world. Although one is a dungeon and the other a space station, both feature inter-connected areas where you can roam everywhere once you unlock the right paths. A key difference between the robots in Prey and those in this survival horror is that in Prey, you can fight back. In atmospheric terms, though, the two games feel close. Both feature juddering, malfunctioning bots that talk to themselves in horrid, cryptic, broken sentences. And although you can gun down robots in Prey, it’s often a good idea to avoid them instead. 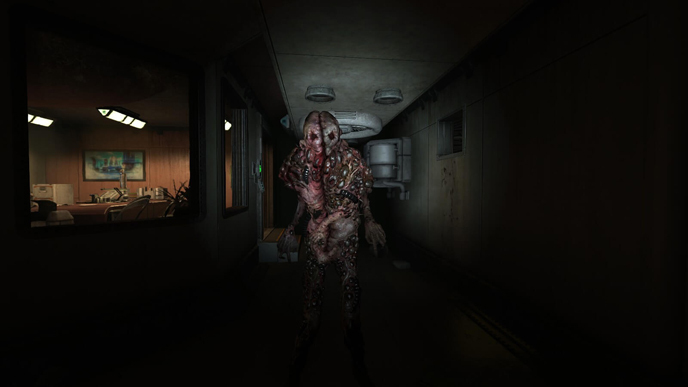 Hiding and creeping round them as they spit and hiss dangerously nearby is a key source of tension in both games. Finally, while Prey starts out to frighten you with jump scares, it’s long term goal is more psychological horror. Story-driven horror is what SOMA does best, to the point where some have recommended playing it with a non-lethal enemies mod. While that might not work in Prey, the late-game twists should still leave you plenty of nightmare fuel. Matt Thrower is a UK based freelance writer on video and tabletop games. His work has appeared in PC Gamer, The Guardian, GamesRadar and many other outlets. He’s on Twitter at @mattthr.